Conkers (seeds/nuts of the horse chestnut tree), may be synonymous with autumn but did you know that they can pose a serious risk to your dog if ingested. 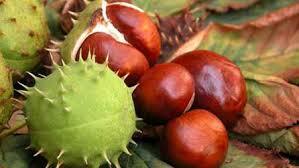 Conkers contain a poison called aesculin which is toxic to dogs. A dog would normally need to ingest several conkers to suffer severe poisoning. Clinical signs are usually seen between one and six hours after ingestion, although they can be delayed for up to two days. Increased thirst and reduced appetite. Signs of restlessness, wobbliness and muscle tremors may also be seen. Poisoning is not the only risk – these large nuts could cause a blockage in your dog’s stomach. Although fatalities in cases where dogs have consumed conkers are thankfully rare it is still very serious, so if you suspect your dog has ingested conkers, please contact your vet immediately. It’s likely the vet will give the dog medication to make them vomit and they may also perform gastric lavage (wash out the stomach). This is designed to ensure as much of the poison is removed from the dog’s system as possible. Although dogs love to forage when they’re out exploring, do keep a watchful eye on them when they’re around conkers. Brexit – a ‘no deal’ scenario?